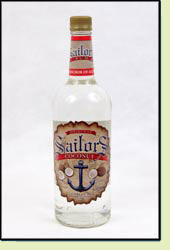 Andy: Sailors Coconut doesn’t have the strong coconut flavor that Marti Coco Suave, Beachbomber, or Bacardi Coco has, so if you are looking for a rum with just a hint of coconut then give this one a shot. It is tasty mixed with pineapple juice, as the coconut flavor just peeks through the taste of the pineapple. Plus when you buy this rum, they donate a portion of their profits to the Armed Forces Relief Trust. That’s definitely a reason to choose Sailors. Adrian: If you are looking for a light coconut flavor, then this is it. It is very smooth with no alcohol bite. A good alternative to Malibu or Bacardi Coco if you want a lighter flavor.